Skin rashes are a common sign of an allergic reaction. Anytime you use a new supplement or medication, you are at risk of developing an allergic reaction. Not all allergic reactions will occur the first time you use the supplement, but if you notice signs and symptoms of an allergy, stop using the supplement and call your doctor. Skin rashes that commonly develop from taking supplements are hives, eczema and general itching. Allergic skin rashes that develop from a supplement can cause minor to severe reactions and need to be assessed by a family doctor, dermatologist or allergist. An allergy can occur anytime you ingest a new substance. If you're allergic to a specific supplement, your immune system will falsely identify it as a dangerous substance. When this happens, the body creates antibodies to fight off the allergy. It may take two or three doses of the supplement for the body to create enough antibodies to cause a skin rash. Once the body has created enough antibodies, histamine levels will increase, leading to common allergy symptoms. 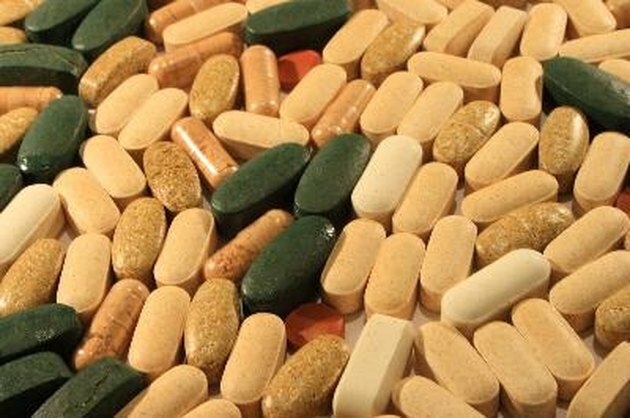 Most allergic reactions to supplements will cause more than just a rash. Other symptoms may include asthma, sinus congestion and gastrointestinal symptoms. Rashes caused by hives commonly develop from an allergic reaction to supplements. Hives cause severe itching, swelling and redness to develop shortly after ingesting the supplement. The rash develops in clusters of welts and may get bigger and migrate to other parts of the body for no reason. Hives can change size and shape and can disappear and reappear in a matter of minutes. An identifiable sign of hives occurs when you press on the welt and cause the center to turn white, which is called blanching. Hives do not pose any threat to the body unless they develop in the throat or lungs, which is unlikely. If you have been diagnosed with eczema, an allergic reaction to a supplement can cause your condition to flare up. Eczema is a chronic skin condition that mainly affects young children but can affect adults as well. Eczema causes patches of skin to become extremely dry and can also cause blisters to form anywhere on the body. Most blisters begin on the arms, legs and face and can crack, weep and crust over. You may develop a general rash or itchiness on your skin from an allergic reaction that's not related to a particular skin rash. Some rashes are a side effect of some supplements. To determine if you're experiencing an allergic reaction or a side effect, you will need to talk with an allergist. An allergist is the most qualified medical professional to diagnose an allergy.